Get lost in the hottest series of the year. From J.J. Abrams, the creator of Alias, comes the action-packed adventure and worldwide phenomenon that is Lost - now even more spectacular on Blu-ray High Definition. Stranded on an island that holds many secrets, 48 people must band together if they hope to get home alive. Now you can experience the nonstop excitement and mystery of every episode from the first series... Presented in a wides..
4, 8, 15, 16, 23, 42. Push the button, and prepare to be blown away by Lost on Blu-ray High Definition. With unsurpassed picture and sound, TV’s most spectacular series is even more intense on Blu-ray. The award-winning drama reaches new heights in its sensational second season as the survivors of Oceanic Flight 815 discover they are not alone in their battle against the Others, and a contested decision to open the hatch reveals a new r..
Find yourself. Find your fate. Find the answers you've been looking for in the explosive third season of the most gorgeous, audacious, expansive series on TV. As the power of the island to both heal and destroy comes into sharp focus, the lines between good and evil are blurred and loyalties are challenged when the survivors of the crash become tangled within the lives of the Others. Plan your escape, and immerse yourself in all 23 epis..
Immerse yourself in the boldest show on television with every mysterious twist and turn of Lost's addictive Fourth Series. Exploding with excitement and never-before-seen extras, Lost reaches new heights on DVD. More than three months after their fateful crash, the survivors of Oceanic Flight 815 will discover that the only thing more dangerous than the island might be the people who have come to rescue them. Dive deep into this captiva.. The epic story of Lost twists, turns and time-shifts in its outstanding fifth season. Packed with bonus material, including a revealing interview with the cast and an exclusive behind-the-scenes feature, Lost is better than ever on DVD. When destiny calls, the Oceanic 6 find their way back to the island. Discover what forced them to return, and find out the fate of all those who were left behind. The answers to some of Lost's most press..
Watch the entire epic story of Lost - the series that redefined television - from its phenomenal opening scene to its magnificent final moment. Uncover the secrets of what caused Oceanic 815 to crash, what ultimately drew the passengers together, and relive their mind-blowing journey as they battle to rewrite their own fate. 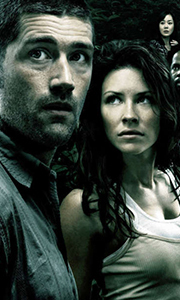 Experience a landmark in the history of entertainment with Lost: The Complete Collection, featuring every episode..